The first New Moon of autumn is “Persephone’s Moon”. bringing about the dormancy of fall and the reflection of winter. 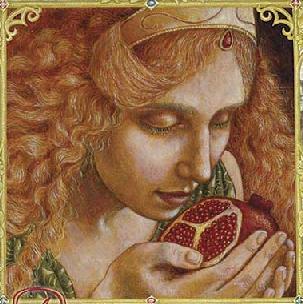 Persephone is a sister goddess of The Great Mother, Gaia. Persephone begins to awaken with the first stirrings of spring, on IMBOLC. Bringing about the renewal and rebirth of spring. Persephone is beautiful, gentle and sympathetic. She radiates a wonderful, bright light. Persephone will help to bring clarity by shedding light upon those “dark” areas of your life, struggling relationships, and your unconscious (the “underworld” within). Persephone can help you strengthen those areas where you are vulnerable. She is especially willing to help women who are in dysfunctional or abusive relationships. and helps us to strengthen & connect more deeply with those aspect of ourself during these months of reflection. Brew a warm cup of mint tea, sit under the New Moon, reflect upon your struggles, and ask the beautiful goddess Persephone for her guidance.